Through her work and her writing, Diane Goldner guides us on the path to true healing. bestselling author of Love, Medicine & Miracles. 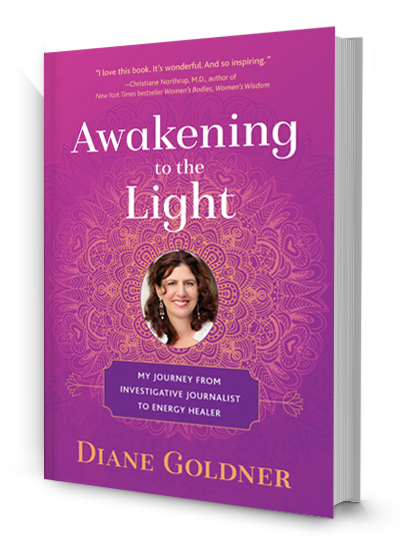 For more than a decade, I've recommended Diane Goldner as a healer. Now, in Yes, You Can Heal, she shares the secrets of healing with you. There is no better gift than that. New York Times bestselling author and the inspiration for the TV Show, Medium. 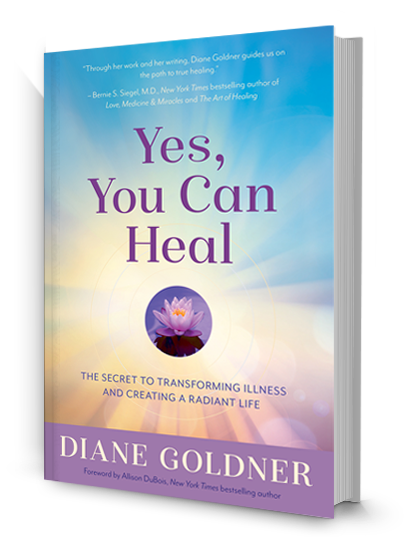 Diane Goldner's book, Yes You Can Heal, offers amazing true stories of successful healing with her many clients. With compassion and wisdom she shares simple yet profound healing techniques that anyone can learn. author of The Soulmate Secret and Hot Chocolate for the Mystical Soul. Healing is a great mystery that invites us along a winding path to personal growth and transformation. Diane is a trusted guide along this path as we explore various steps—embracing body, mind and spirit. Whether you face a life threatening illness or seek a reliable set of tools to manage the stresses of your daily life, Yes You, Can Heal will become an indispensible aid on your journey to radiant health. author of Consciousness and Healing and Living Deeply: The Art and Science of Transformation. I love this book. It's so inspiring. New York Times bestselling author of Women's Bodies, Women's Wisdom. Awakening to The Light is an absolute gem. Diane has written an amazing account of a life turned upside down in the most beautiful way. This is a must read for anyone seeking a deeper connection with a more profound meaning and direction in life. Excerpt at DailyOM.com — A Visit to a Healer. I love How People Heal. Diane has done society a good deed with this book. and host of “The Dr. Oz Show”. Infinite Grace is absolutely wonderful. Reading it gave me the chills and filled me with hope, awe, and gratitude. It’s a roadmap to the unknown and unrecognized power within us all. author of the New York Times bestsellers Women’s Bodies, Women’s Wisdom and The Wisdom of Menopause. I devoured this book in one bite. Yes, You Can Heal is a lighthearted yet deeply meaningful book about how to tap into the soul of personal healing. 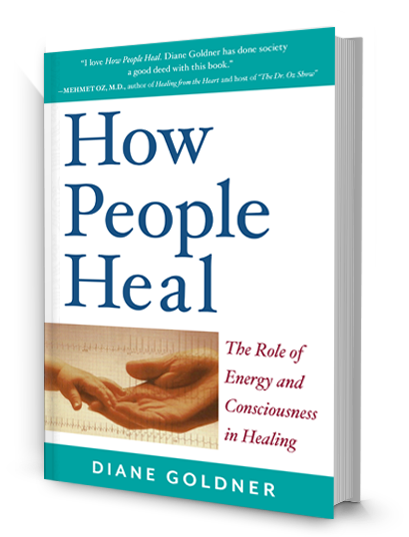 Like Diane’s first book, How People Heal—which was a profound balm for my personal healing and led me on my path to become a healer—this book radiates light and feels divinely guided. For the individual looking to heal, Diane’s book will be their encyclopedia. I found it incredible. Each and every sentence packs a wallop. She shares undeniable truths and tools to transform and create health, on all levels. No one is left in the dark and helpless. I’m absolutely blown away by the insights found in Yes, You Can Heal. Diane Goldner has been a part of my family’s life for over ten years. My wife and I have a daughter who has multiple medical issues including 15 major spinal surgeries, optic gliomas, bone infections and dozens of hospitalizations. Over the years I have seen Diane’s energy healing have a deep and profound effect on virtually every member of our family. I have seen nerve inflammation reduced, tumors shrink, anxiety relieved, PTSD managed and spines straightened. At my daughter’s last doctor’s appointment the oncologist was so pleased to see her optic tumors had become completely inactive. He remarked, ‘I don’t know what you’re doing, but keep it up.’ This was after multiple MRIs and healings with Diane. Through the years as I came to rely on Diane’s healing energy she would always insist that her skills and gifts were not exclusive to her. Now, in Yes, You Can Heal, Diane teaches us how to make healing our own gift to ourselves, and the world. I was so deeply impacted by Diane’s wisdom about energy healing in Yes, You Can Heal, including the power of the ways she shares that we can use to heal ourselves. At a time when chronic illness has reached epidemic proportions, this is a much-needed book. Reading it, I experienced the deep truth of it, along with joy and delight. Can a book heal? This one does. It has an energy that is released to the reader. I felt it. As a healer myself, I could relate to everything Diane so candidly describes. If you read only one book on healing make it this one. This book should be a movie. This is a magical book that resonates with healing energy and light. Diane writes clearly and honestly about her journey, from what she had perceived to be her path as a journalist, towards a life-changing awakening that literally transformed her whole being to become the gifted healer that she is now. I could not put this book down once I began reading. Diane’s gift for writing allows you to relate to her journey in a very personal way. The book gave me goose bumps many times. It has become my favorite, which I now keep beside my bed, and flick to a page for wisdom comfort, inspiration or peace. After I finished reading, I lay down and closed my eyes. The angels came and you were there. I had a healing of a pain that had been bothering me for years.